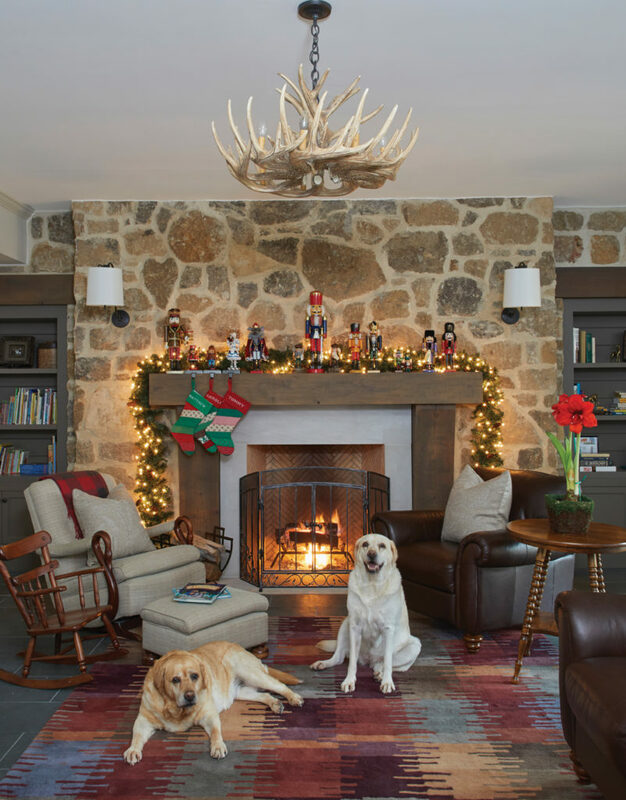 For writer Molly Powell, the holiday season doesn’t officially begin until the whole family gathers to decorate her in-laws’ home, nestled into the hills near Mountain Brook’s Dolly Ridge. The Christmas that my now-husband and I got engaged, my mother-in-law-to-be presented me with a blank needlepoint canvas. In response to my puzzled look, she explained that she planned to needlepoint it herself and have it made into a stocking for my first Christmas as an official member of the family. Looking up at their mantel that night, I examined the family members’ stockings, each handmade over the years by an experienced hand filled with love, and realized that this was only the start of the traditions in which I would now get to play a part. Traditions help make the holiday season a steadfast feature in our lives. Things change from year to year of course — new family members, new homes, and new schedules—but traditions always root us in memory and wrap us in the comfort of time-tested patterns, giving us a glimpse into the past as well as a peace about the future. One of the most memorable traditions of any Christmas season is decorating day, or, as in my family’s case, decorating weekend. Luckily, my in-laws kept this particular weekend in mind when working with Christopher Architecture & Interiors to build their new home. They requested the addition of a custom feature—a Christmas closet— that now makes our decorating tradition a cinch. Located off the great room and through the loggia, the closet houses all of our favorite holiday decorations in one convenient, attic-free location. All we need to get the decorating started are some carols on the speakers and a step stool to grab the boxes on the highest shelf. In no time, the lights are strung, wreaths hung, and the stockings (mine included!) take their rightful place along the mantel. The house itself offers the perfect canvas for holiday decorating. 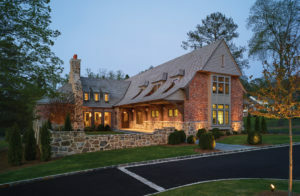 Light, neutral paint colors and calming fabric tones offset the rich wood flooring and an impressive stone chimney that runs the height of the structure, while floor-to-ceiling windows on either side of the living room offer front-row views of the changing seasons. Building a fire in the wood-burning fireplace and lighting a few candles helps to cozy up the expanse connecting the great room to the kitchen. 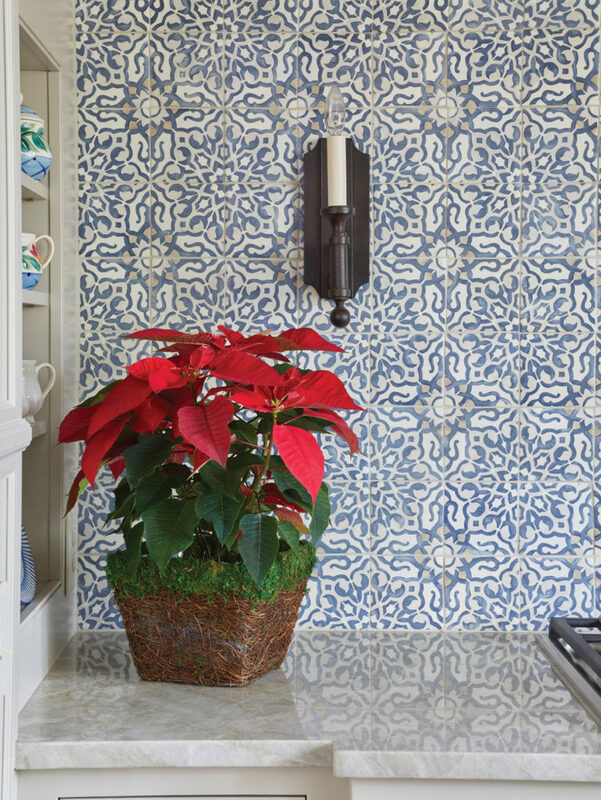 The palette is especially brightened by the reds from a well-placed poinsettia or the orangey hues of an amaryllis in full bloom during the holidays. The deep greens of fresh garlands and wreaths are as pleasing to the eye as they are to the nose, as the scent of pine lightens the air from room to room. Fresh decorations are always a must at this time of year, but the decorations that have been passed down from generation to generation hold a special place in our hearts and homes. 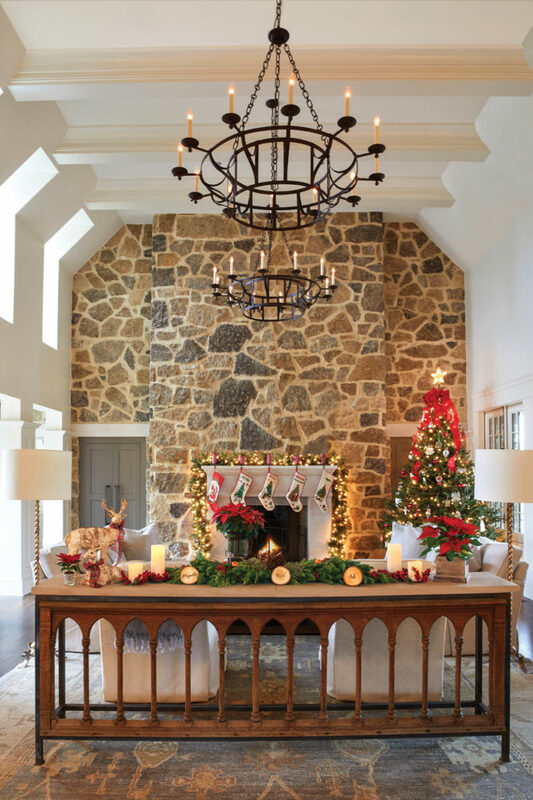 The hand-crafted chrismons showcased on our family tree and the decades-old manger scene in its place of prominence on the antique chest in the foyer are nods to loved ones old and new. These cherished items create unmistakable conversation starters with holiday visitors. Just like favorite ornaments, the home’s everyday décor has its own story to tell. The sofa table, for example, features a wooden remnant from a country church and a bespoke iron frame topped with Alabama limestone. At Christmas, the table serves as home to treasured items such as birch bark deer and rabbit figures and hand-cut oak rounds. Though each element is unique and beautiful in its own right, the combination of antique and modern, soft and bold, emphasizes the importance of remembering the past while sharing its traditions—and ourselves—in new ways and with new friends and family. 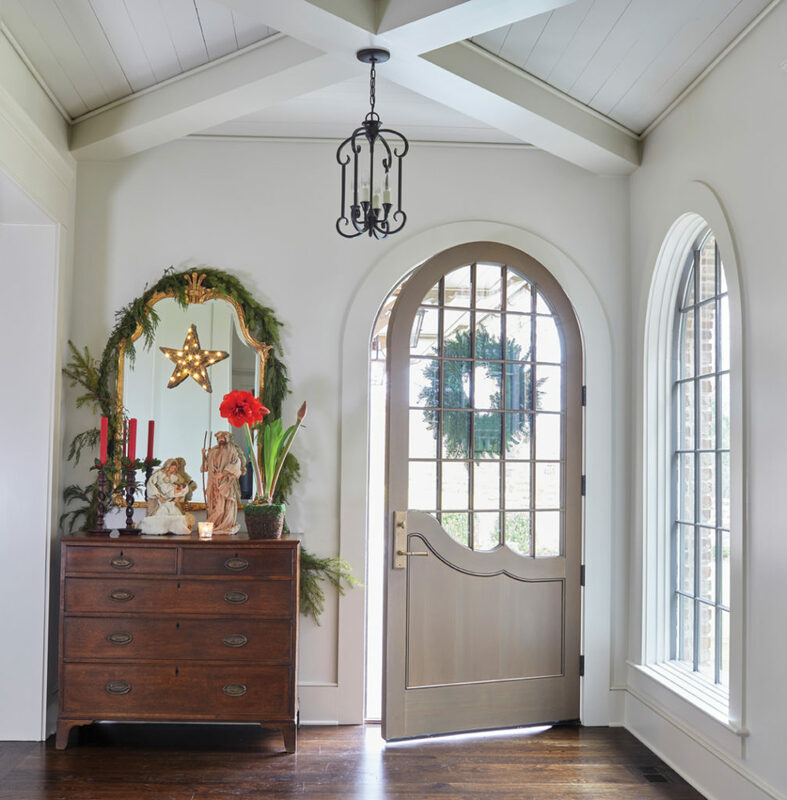 It’s something that this home—and especially the Christmas closet—reminds me to do, not just during the holidays but year-round.